KANNAPOLIS, N.C. (Sept. 6, 2017) - As the Kannapolis Intimidators, Class A Affiliate of the Chicago White Sox, prepare to open the 2017 post-season, the team has announced a special in-stadium raffle at Friday's home playoff game to help raise money for Hurricane Harvey relief in conjunction with Minor League Baseball and MiLB Charities. Fans at the playoff game Friday, Sept. 8, can purchase raffle tickets to enter to win a team-signed Stars & Stripes Military Jersey, a team-signed bat, an autographed 2017 team card set, a Darryl Strawberry signed baseball, and more, and MiLB Charities will match all combined club donations raised, up to $10,000. Gates open at 6 p.m. for Game 2 of the Best-of-3 series against the Greensboro Grasshoppers, and first pitch is set for 7:05 p.m. at Intimidators Stadium supported by Carolinas HealthCare System. 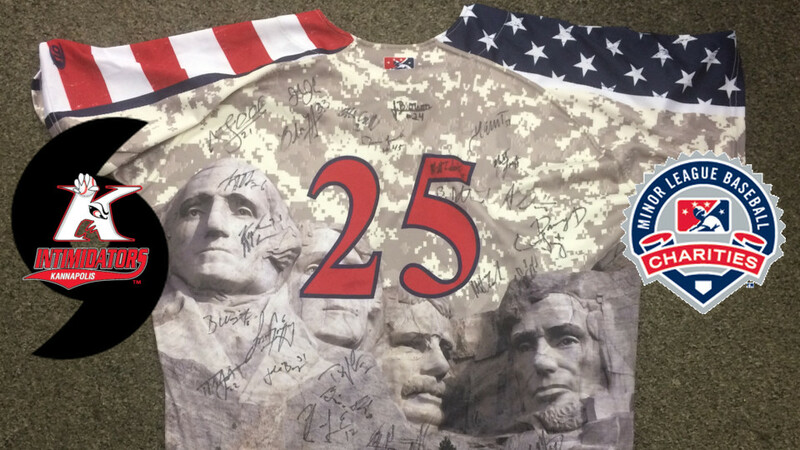 Fan unable to attend the game can participate in an online auction for a second team-signed Stars & Stripes military jersey to raise money for Harvey relief. The Intimidators are also accepting donations to send to the relief effort at the ballpark throughout Friday's playoff game. Tickets to the South Atlantic League Northern Division Series in Kannapolis are available by calling the F&M Bank Box Office at (704) 932-3267 or by visiting IntimidatorsBaseball.com. The Intimidators begin the 2017 post-season tonight at Greensboro with Game 1 of the Best-of-3 series at First National Bank Field at 7:00 p.m. Kannapolis will host Game 2 on Friday at 7:05 p.m. as well as Game 3, if necessary, on Saturday at 7:05 p.m. The Intimidators are currently playing the 23rd season of professional baseball in Kannapolis and 17th season as a Chicago White Sox affiliate. Since the team's inception in 1995, a total of 98 players have gone from Kannapolis to the Major Leagues. The team plays at Intimidators Stadium supported by Carolinas HealthCare System located off I-85, Exit 63 in Kannapolis. Single-game tickets are available by calling the F&M Bank Box Office at (704) 932-3267 or by visiting IntimidatorsBaseball.com.